Friends of Cozumel will host a variety of mission projects. We anticipate 27-30 volunteers will be involved including our informal leader group, family members, island residents, and visiting volunteers. Other visitors who may be on the island during these dates are welcome to join us. Projects: distributing school supplies, youth activities, providing learning workshops and ministry efforts. We will distribute clothing, home and personal gifts as well as food to selected families in need. This is a tentative time frame. Actual dates will be announced in August. Winter mission weeks are designed primarily for adult volunteers age 18+. There may be selected activities for youth volunteers. Winter mission weeks tend to be a more intense schedule of activities planned for 5-14 days. This tentative time frame is approximately 10 days after Cozumel’s Carnaval celebration and before most spring breakers arrive in March-April. Volunteer full-time (all days) or part-time (any # days you select) or volunteer for just 1 activity. Optimal group size: Maximum of 20 full time volunteers including visitors and island residents, plus an additional 5-15 part-time volunteers including those who volunteer for one or more activities. Interested in volunteering? Email: Karen@friendsofcozumel.com to request info or place your name on the list of potential participants. Karen or one of our Friends of Cozumel leaders will be glad to arrange a phone call at your convenience to discuss questions you may have about mission weeks. •	Choose the participation option that best fits for you: Full-time (all days projects are scheduled); Part-time (any # of days you select) or just for one or more activities. •	You can arrive earlier or stay later than scheduled mission week dates. If your time is limited, join us any day(s). •	Visiting volunteers are responsible for their own travel arrangements (flights, lodging, transportation, food). •	What will it cost? Approximately $1,000 – $1,650 for 5-7 days, more for extended stays. There are many variables depending on your travel/living preferences. The cost could definitely be less with a good deal on airfare and using shared/discounted lodging as these are the two largest expenses in addition to personal entertainment like diving or other excursions. •	Online tools used by several Friends of Cozumel volunteers to research the most economical flights on different days are www.google.com/flights and/or http://matrix.itasoftware.com Use the option of “See calendar of lowest fares” (not “Search for exact dates”). Put in a range of days for length of stay i.e. 7-10 nights. It will display a calendar showing the least expensive airfare for all airlines departing on various days for a month following the departure date entered. Moving the cursor over a specific date will show prices for different lengths of stay. You can click to get details about flight itineraries. This is a research and monitoring tool that is a GREAT source to combine fares from all major airlines. Tickets can’t be purchased on this site. When you find a flight you like, you can book online at the airline’s website or give the info to your travel agent. •	Flight planning tips: Watch carefully—not all flights to Cozumel are same day connections. Although it is more convenient to fly in/out of Cozumel, you may want to consider a multi-city option to fly to Cozumel and out of Cancun if you plan to spend some time on the mainland or if there is significant cost savings. Some volunteers fly roundtrip to/from CUN because there are more flights. It requires a one hour drive to Playa del Carmen and then a 35 minute ferry ride to Cozumel. We can provide you the ground transportation options and approximate costs if you are interested. •	Airport transfers: ~$10-12pp for airport transfers from the Cozumel airport to mid-town locations via the required transportation union vans; more for locations north or south of town. You may return by taxi to the airport at the end of your stay. •	We recommend purchasing trip insurance that covers flights and pre-paid expenses like lodging deposits in certain circumstances (i.e. health, weather) for canceling or interrupting travel. This may also be an important resource to provide medical insurance needs while you are traveling. •	 Location: Friends of Cozumel does not have a formal mission “headquarters”. We work from homes of volunteers in the “mid-town” area close to Calle 11 and Av 55 and from our rented “bodega” storage space close to 65 Av and Calle 7. These locations are approximately one mile inland from the T-intersection of Melgar (ocean front road) and Calle 11 (near Margaritaville, Rolandi’s, and the Municipio park). Taxis are affordable and most destinations are 5-10 minutes from the center of the town. •	Mission project sites: 1+ mile(s) inland from the central downtown plaza area. • Volunteers are responsible for making their own lodging arrangements to ensure they find the best option for their unique needs. •	 Hotels, rental villas, hostels, B & B’s—Cozumel has it all! Most of our mission volunteers have found it more economical and comfortable to stay in rental villas with kitchen facilities in order to prepare some meals and have cold beverages handy. Villas have more room to relax and can offer more privacy than most hotel accommodations. Other mission volunteers combining vacation with mission projects prefer the service amenities of a hotel for family/friends who may be involved in non-mission activities. Where you stay is not a problem . . . just be sure you have a way to easily communicate with Friends of Cozumel project coordinators once you reach the island and you can arrange your own transportation to mission activities. We do not have transportation resources to pick you up from your lodging. •	Friends of Cozumel will provide recommendations upon request for various types of lodging, online sources to search, and help facilitate individuals, families or friends interested in sharing rental villas during their stay. Request information by identifying your preferences of amenities (refer to list below) via email to Karen: Karen@friendsofcozumel.com. If you identify a property online you are interested in knowing more about, we can check it out for you if we are not familiar with the property. •	Lodging costs: Be sure to clarify what is/is not included in quoted price. Some properties quote an “all inclusive” rate while other properties quote prices as a weekly or nightly cost PLUS 19% lodging tax extra; some rental properties charge for actual use of electricity in addition to quoted price and/or cleaning deposits and/or required maid gratuities. Note rates may differ for high/low seasons. Discounts may be available upon request for extended stays greater than 7-10 days, booking less than 30 days in advance or some owners may provide a modest discount to support your efforts as a mission volunteer if you explain your purpose in visiting is to benefit the community. IF you are staying for 2-4 weeks, it may be significantly less expensive to request and pay for a monthly rental rate even if you will be staying for less than four weeks vs. a nightly or weekly rate. •	Cozumel has wonderful restaurants . . . everything from high end/pricier tourist spots $15-$50 Usd per meal to local taco places where you can eat for $3-$5 Usd. Cost of alcoholic beverages in tourist bars/restaurants can really add up so food/drink costs can vary a great deal based on your choices. 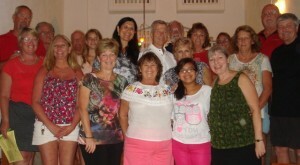 •	Mission weeks typically include one or more group meals or happy hour get-togethers. Friends of Cozumel does not have a sponsoring organization that funds mission trip expenses. We don’t charge an administrative fee for participating. One or more host volunteers shares cooking for the group but we need $s to buy groceries. Requesting volunteers to contribute to a kitty helps defray the cost of food and beverages. •	Volunteers may decide to eat at local taco places and inexpensive restaurants during mission activities to take advantage of local food. These are Dutch Treat, optional opportunities.